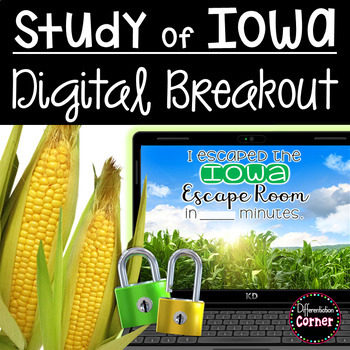 This digital classroom escape room is an interactive Iowa State Study or Iowa History activity that is completely paperless! Your students will love this breakout activity that encourages peer collaboration and problem solving. 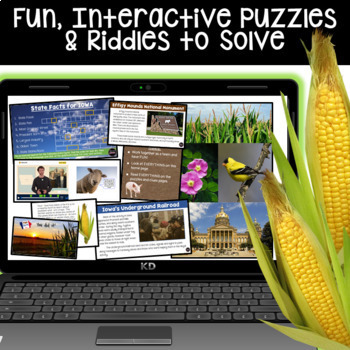 In this activity, your students will encounter the Iowa State Facts, Iowa's involvement in the Underground Railroad, Iowa history, Effigy Mounds National Monument, real world word problems and solve puzzles and challenges to unlock the 5 digital locks, and help some kids escape a corn field! Click here for more escape rooms! EASY PREP! No printing, cutting, laminating, hiding clues, locks and boxes to buy. Everything is right there for your students! Just print out the included teacher's manual pages. There are screenshots and step by step directions! Students work as a collaborative team for problem solving. Your students will encounter different types of puzzles and challenges. Just share the link with your students or assign in Google Classroom! Optional printables are included if you'd like to add a little more novelty! 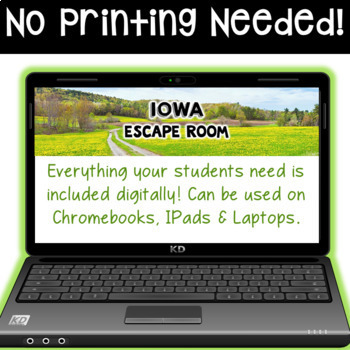 Make sure your district does not block YouTube, Google Sites or Jigsaw Planet on your or your students devices before purchasing this Digital Escape Room. I am not responsible if you can not access these websites. Please check them first! 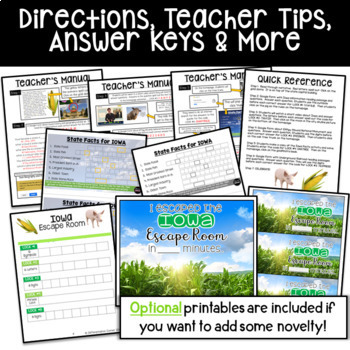 Purchasing this resource allows you to make copies for your own classes only. You can also place this file on your own password-protected class web page. You are not allowed to make copies or distribute links to other teachers, or place this file or link on a public web page or server. If you wish to do this as a teaching team, please purchase additional licenses.